A huge obstacle faced by Hijinx actors in the UK is that casting sites such as Spotlight require professional qualifications to list an actor. These qualifications can be inaccessible to people with learning disabilities. Even if they were able to join the mainstream casting sites, learning disabled actors may require additional support which would be difficult to communicate with the limited fields provided. This makes it even harder for actors with learning disabilities to find paid professional work. In spring of 2016, Hijinx was one of nine successful arts organisations to receive funding through NESTA and Arts Council Wales’ Digital Innovation for the Arts in Wales (DIFAW) and they asked us to work with them to create a site that would address these issues. We made the decision to allow actors to be filtered by impairments – that is to say, “show me actors with Aspergers” or any other of the 13 impairments the site covers. This decision came out of a lot of conversation about whether Hijinx actors should be defined by their impairments. Ultimately it was decided that casting agents could quite reasonably be looking for an actor to play a character with Down’s Syndrome. Actors’ individual pages are presented with a personal statement, an introductory video and a gallery of images. We list their credits, physical characteristics and details of training they’ve received along with the actor’s impairments and the personalised support Hijinx will be able to provide. On the actors’ individual pages they’re presented with a personal statement, an introductory video and a gallery of images. 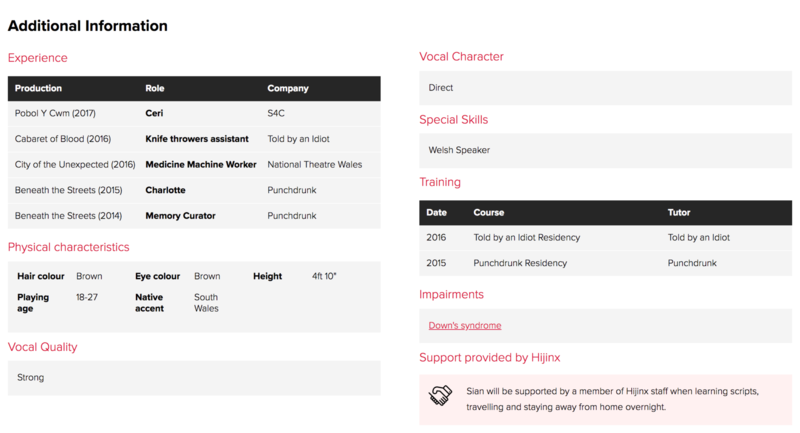 We list their credits, physical characteristics and details of training they’ve received along with the actor’s impairments and the personalised support Hijinx will be able to provide.